Just popping in to wish everyone a wonderful weekend. No matter how you observe (or not) this religious holiday hope you get to spend time in the company of family and good friends. Oh, this bunny is darling. You always make me want to decorate and be creative when I see all your wonderful pictures. Happy Easter, sweet friend of mine. 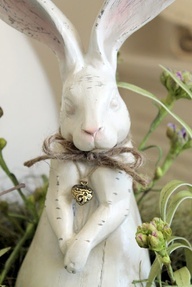 Happy Easter to you darling Alina..... love the rabbit. Hope you had a Happy Easter Alina! I'm a bit late as usual, but I hope you had a good Easter too Alina! HUgs kindred..beautiful post and adorable image! Wishing you a most magical season of Spring and all celebrations!Here's to many new memories in our gardens this year....and many magical moments for you in the purple caravan too!